Howard Leigh is the Senior Partner of Cavendish Corporate Finance LLP, the UK leading specialist advisor to entrepreneurs wishing to sell their business. 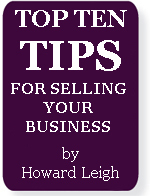 Here, Howard provides his top ten tips on ‘selling your business’. The earlier you plan to sell the business the better better – it’s a good idea to ask a friendly accountant to carry out due diligence on your company before you go out to sell – it will save you money down the line. Appoint a team of trusted advisors at an early stage stage – put a negotiator between you and the buyer so if discussions get heated you are able to work with them afterwards without the relationship being affected. Ensure your business is structured to maximise capital value as well as profit. Don’t fuss too much about the information memorandum – the management presentations are more important. Ensure you are able to reach overseas purchasers appropriate to the size of your business. Consider outside communication about the sale process carefully, particularly to management. Structure the sale exercise to allow as many appropriate potential purchasers to consider the opportunity. Ensure the heads of terms covers as many points as possible, don’t be rushed into contract – it’s important to cover this in detail because it will help prevent the purchaser from chipping the price. If the purchaser is taking advantage of the exclusivity period, ensure you have an exit route. Do not underestimate the amount of stress you’ll be under and plan accordingly. Howard Leigh is a frequent lecturer, author and broadcaster on mergers and acquisitions and has written the “Good Practice Guideline: Selling a Business”, published by the Institute of Chartered Accountants.